Advertising Archives - POP GOES THE WEEK!! 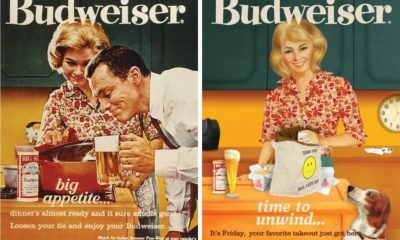 The brand tackles old gender stereotypes with new versions of their 1950's ads. This short animated film portrays the ugly truth about mass market food production. If you care about what you eat, it's a moving thing to see. LOL: KMart’s “Ship Your Pants” Ad Is SO Out There Your Jaw Will Drop. Sometimes an ad is simply cool to watch. The latest spot for Baileys Irish Cream is just that. Super Bowl Favorite: Oreo Softly Becomes A Fan Favorite. Budweiser has a winner in this Super Bowl ad - featuring a Clydesdale and the man who raised him. A must see! The leotard, the huge box, the dancers in the background. The. Whole. Thing. See why Courteney Cox's 1985 commercial for Tampax Tampons is fantastic. POP SNAPSHOT: Vintage Ad Insists: For A Better Start In Life, Start COLA Earlier! "How soon is too soon? Not soon enough!" says this vintage ad from the Soda Pop Board of America. How times change! FUNNY VIDEO: Is There A Rule That A Man Will Always Carry ALL The Groceries In One Trip?